While the British Metropolitan police were quick to raid Safa Einollahi's house and suspect him for "terrorist" activities, or shoot Jean-Charles Menendez, the innocent Brazilian, five times in the head, they seem to be some what more lethargic in moving against the real threats against this country. A group called Vigil, have infiltrated one of the most extremist groups in Britain, the radical al-Muhajiroun group, headed by Omar Bakri Mohammed, yet they claim the British police are just not interested in their evidence. One academic, who is a member of Vigil, contacted the Metropolitan Police's anti-terrorist hotline saying he had more than 100 hours of material from the chatroom only to be told to contact his local police station. "The anti-terrorist office showed no sense of urgency to get this information," he said. 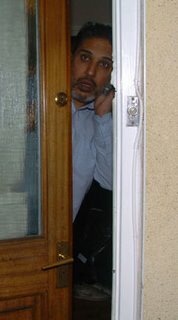 It has also been emerged today that a senior executive officer, Abid Javid, in Immigration and Nationality Directorate which processes tens of thousands of asylum and visa applications every year, is a member of the fundamentalist Islamic group Hizb-ul Tahrir which believes in a worldwide Islamic state under Shariah law. I have seen tens of genuine asylum applications by bonafide secular Iranian political activists refused by the Home Office, and yet unsavoury characters determined to break up the very fabric of this society keep pouring in. I always suspected infiltration in the Home Office by Islamic radicals and have written about it in the past. Today's news confirms my suspicions. To speak out your mind and to try to tell the truth to the English establishment, when it does not suit their foreign policies is to invite harassment, losing one's job and being deported. That is why a lot of Persian in this country stay silent and withdrew from politics. Sham on the British police who should know better than to make trouble for the freedom seeking innocent Persians who only want to tell the truth and stop this terrorists madness. (including the killings of the British forces in Iraq and Afghanistan). Have you read the book "Lonodonistan" by Melanie Phillips? Potkin, dear, You're not being reasonable. What else did you expect? The Brits are obligated to defend their puppet mullahs. They're just protecting the investment they made in 1979. It's all good. Ian Blair, the Met chief, should have been made to resign after shooting of the innocent Brazilian. He is absolutely hopeless. "senior executive officer, Abid Javid, in Immigration and Nationality Directorate...is a member of the fundamentalist Islamic group Hizb-ul Tahrir"
Meet the Iran Enterprise Institute. Its name might sound familiar. Unchastened by the catastrophe of the Iraq war or the setback delivered to the White House and Republicans in the midterm elections in part as a result of it, Iran hawks have organized new efforts to promote U.S. support for regime change in Tehran. This woman needs to be stopped. What can we do to stop her vile attempt at character assassinations of our political activists? People should know better than to believe baseless accusations and dubious testamonies. Vigil is nothing more than a conspiracy-theorist group. It is no more serious than anti-government conspiracy-theorists or even UFO-seekers! I suggest that serious attention should be paid to the real issues- the government and media's attempt to ban political dissent in their country. The difference between the west and the middle east, is that at least in the middle east, there are no pretentions to free speech. The government is open about the fact it suppresses political dissent. Whereas in the west, if you expresses ideas contrary to the established belief, tastes and interests of the society/government- you will be labeled 'extremists' and attempts will be made to ban you. My favourite quote is by malcolm X: "What we are witnessing, is the hypocrisy of democracy"
Vigil's founders believe that the police, security and intelligence services are so overstretched that they need help. The organisation seeks to make Britain a safer place by disrupting and exposing terrorist activity. It is also working with media groups to highlight the threat from Muslim extremists. Last week it teamed up with BBC2's Newsnight* and Radio 4's File on 4*. Now this, under the UK Governments own enacted 'Terror' legislation, is ILLEGAL ! It has five paid staff and a further 25 workers, many with military, security, intelligence and financial experience who charge only their expenses.